A great city under the sea, covered by a crystal dome. 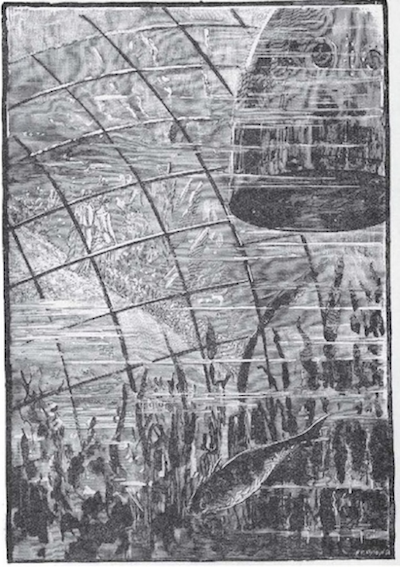 The diving bell had crashed into a colossal dome of thick crystal plates, and remained fixed there. This crystal dome, illuminated with a dazzling light, which made the electric lamp look pale, was completely visible in all its parts, and appeared to belong to an immense conservator, covering the most strange and luxuriant vegetation. Further along, there seemed to be a continuation of the building, in the shape of galleries, likewise of crystal. All these galleries, like the dome, seemed to have a double transparent roof divided into compartments by water-tight partitions... Under the lower roof there was no water, but a clear and luminous atmosphere, where giant trees, handsome ferns, and many-colored flowers seem to live a luxuriant life. The floor of the submarine conservatory was covered with fine white sand, forming, as far as the eye could see, alleys crossing each other at right angles. From The Crystal City Under the Sea, by Andre Laurie. Compare to the bubble city from Roger Zelazny's The Eve of Rumoko (1976).